A container leasing company makes available various container lease options, ranged from short-term spot leases to long-term master leases. A spot lease is a short-term lease sometimes called a trip lease. 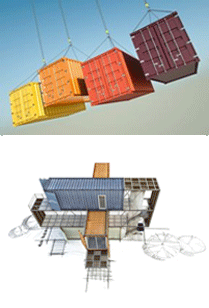 The lease is for one or more containers for a short time period or for a specific trip or purpose. As a result of market conditions the prices for spot leases tend to fluctuate widely. Because of these fluctuations users should not depend on spot leases, although it is possible to get a low priced spot lease by shopping around. The container leasing company, however, tends to minimize spot leases to ensure that it does not have too many unleased containers in a low rate period. A term lease is when a lessee needs a container for a prolonged period. This type of lease usually comes without any additional services from the lesser other than buying the container from the manufacturer and leasing it. Usually the lessee is responsible for repositioning the container. Master leases are long term leases also know as "pool management plans" or full service leases. In the case of a master lease, the container leasing company is responsible for managing the container fleet, which includes maintenance, repair, repositioning, and other services. Master leases are complicated involving a system of debits and credits relating to the condition of the containers at the time of interchange and service.The price of master leases fall when leasing companies compete with each other, especially during periods of light demand. Carriers can then take advantage of having their containers repositioned without a lot of work or responsibility. The reduced price of the master leases can in some cases be lower than the cost of doing the work in-house. Most of the freight forwarders and all the trucking companies interviewed indicated that they did not have access to a container pool.